On Oct 1, 2012, the Perth Mint in Australia released the latest issue of a popular Gold bullion series: the 2013 Australian Gold Kangaroo. Much like the previous releases in this series, these Gold Kangaroos are issued as Australian legal tender and guaranteed by the Commonwealth Government of Australia. The 2013 Australian Gold Kangaroos are offered in sizes of 1/10 oz, 1/4 oz, 1/2 oz and 1 oz, as well as the larger 1 kilo size. The smaller sizes (1/10 oz to 1 oz) have limited mintages of no more than 350,000, depending on size, which gives them high numismatic value. Their worldwide distribution facilitates easy purchase and liquidation, making them good investment pieces, as well. The Australian Gold Kangaroos have been offered by the Perth Mint since 1989 and are one of the few Gold bullion coins to change its reverse design each year. This year’s issue depicts a kangaroo standing against the Australian outback. The kilo coin differs slightly, in that the image is instead a hopping Red Kangaroo. The “P” mint mark appears on the reverse of each coin, along with the inscriptions “Australian Kangaroo,” the date, size of the coin, and the purity, “9999 Gold.” The obverse of each coin shows the Ian Rank-Broadley likeness of Queen Elizabeth II, as well as the coin’s monetary denomination. 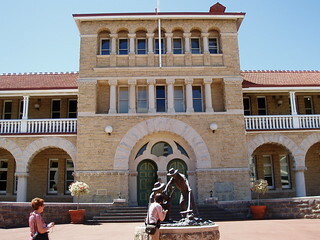 The Perth Mint opened in 1899, originally serving as a branch of Britain’s Royal Mint to help supply Gold sovereigns and half sovereigns, which were used as everyday circulating coins throughout the British Empire. In 1970, control of the mint passed from Britain to the Western Australian Government, which still owns it today. To add these beautiful coins to your collection or your investment portfolio, shop APMEX’s selection of 2013 Australian Gold Kangaroo bullion coins. APMEX makes it easy to buy Gold by offering competitive Gold prices on all Gold coins and bars. In 1990, the Perth Mint of Australia began minting an unusual Silver bullion coin: the Silver Kookaburra. These beautiful coins celebrate the very interesting bird native to Australia. The kookaburra is the world’s largest kingfisher and is sometimes called the “laughing jackass” because of its chattering calls. Each year features a different reverse design, and the 2013 is believed to be one of the stand-outs of the entire series! The reverse of this year’s issue displays two kookaburras sitting on a tree branch, similar to the 1994 and 2001 designs, but in much nicer detail. Each 1 oz Silver Australian Kookaburra contains .999 fine Silver and includes prooflike frosting in the central design. The obverse of this Silver coin features a portrait of Her Majesty Queen Elizabeth II and lists the face value of the coin, which originally was $5, but was lowered to $1 in 1992. The Perth Mint began in 1899 as a branch of Britain’s Royal Mint in order to help supply the Gold sovereigns and half sovereigns that were used as everyday circulating coins throughout the British Empire. In 1970, control of the mint passed from Britain to the Western Australian Government, which still owns it to this day. Don’t miss your chance to own these beautiful collector’s items. Get your 2013 1 oz Silver Australian Kookaburra coins from APMEX today! 2013 Year of the Snake Just Arrived. Win A Trip To Australia. In Chinese Mythology, the snake is a symbol of grace, charm and independence, and it is believed that those born under this sign embody these characteristics. The latest release of the Perth Mint’s Lunar Series II is the 2013 Proof Lunar Year of the Snake, available in Gold & Silver and in multiple sizes. The reverse, or back, of the stunning Silver coin depicts a snake curled around a tree branch, while the Gold coin depicts the snake curled in grass and bamboo shoots. The Proof finish adds to the coin’s beauty with a mirrorlike background that enhances the raised design. APMEX and the Perth Mint are teaming up for our 4th Annual Escape to Australia. The winner receives round trip airfare for two to Perth, Australia, hotel accommodations, $1,000 AUD in spending money and a private VIP tour of the Perth Mint. But hurry, eligibility closes on Friday, October 5, 2012. TO QUALIFY, SIMPLY PURCHASE $250 OR MORE IN 2013 PERTH MINT COINS, LIKE THE LUNAR YEAR OF THE SNAKE, AND YOU WILL AUTOMATICALLY BE ENTERED TO WIN*. You can choose from 2013 designs like the Year of the Snake designed for Perth’s Lunar Series II or the 2013 Silver Australian Kookaburra. So take advantage of this great opportunity to own some of the most beautiful coins minted for 2013 and the chance to escape to the exotic land down under – Australia! *Purchase not necessary. Click Here for complete rules and details. Kangaroo minted Gold bars are meticulously struck from .9999-pure Gold. Each minted Gold bar bears the Perth Mint’s distinctive logo of a majestic swan on the front. The back of each Gold bar is decorated with kangaroo motifs, symbols of the Australian Outback where Gold has been mined in commercial quantities since 1851. Each 1 oz Gold bar is individually sealed in a tamper-proof assay card featuring a unique serial number along with the signature of the mint’s chief assayer certifying the Gold content and purity. Multiples of 25 will typically come in sealed boxes. Because Perth Mint Gold bars are eligible for Gold IRA accounts, these Gold bars are a great way to diversify one’s wealth. Buy Perth Mint Gold bars to add to your Gold collection or Gold investment portfolio. How can your portfolio benefit from the value of Gold? Speak with a knowledgeable Account Manager at APMEX to learn about using Gold as an investment and make your Gold purchase today. Also, you can come to us when it is time to sell Gold and sell Silver. Gold Triple Play – Here’s your chance to make a Triple Play! Now you can add to your holdings the 2012 1 oz Gold Kangaroo, 1 oz Gold Maple Leaf (Random Year), and 1 oz Gold Krugerrand (Random Year), each at a special discounted price! But hurry! These offers are good only through the duration of the special Triple Play sale, while supplies last! The obverse of the Australian Gold Kangaroo bears a profile of Queen Elizabeth II. The reverse features a widely recognized symbol of Australia: the kangaroo. An iconic representation of the fascinating wildlife inhabiting Australia, the Australian kangaroo brings the Gold Kangaroo bullion coin series to life. The Australian Kangaroos vary in design and are meticulously made. Struck from .9999 fine Gold, the Gold Australian Kangaroo is among a few major pure Gold bullion coins that change their reverse design annually. Australian Gold Kangaroos are issued in various sizes with face values in Australian dollars. Gold Maple Leaf bullion coins are a great way to invest in Gold, and many consider the Maple Leaf to be one of the world’s most beautiful Gold coins. The obverse of the Gold Maple Leaf features Queen Elizabeth II, while the reverse of this 24 karat Gold coin depicts the symbol of Canada: the iconic maple leaf. Each Maple Leaf Gold coin is legal Canadian tender guaranteed by the government of Canada for its weight and purity. At up to .99999 fine pure Gold, the Maple Leaf bullion coins are some of the world’s premier Gold bullion coins. The South African Gold Krugerrand was the world’s first modern bullion Gold coin and remains one of the most popular Gold coins ever minted. Released in 1967, the Gold Krugerrand coin is an international symbol of wealth and prestige. The obverse of the Krugerrand Gold bullion coin features the South African Republic’s first president, Paul Kruger. The reverse of the Gold Krugerrand depicts South Africa’s symbol: the springbok gazelle. Also listed here are Gold Kangaroos, Gold Maple Leafs and Gold Krugerrands in smaller sizes of 1/2 oz and 1/4 oz. To add any of these highly prized coins to your Gold coin collection or Gold portfolio, shop APMEX’s wide selection here. APMEX makes it easy to buy Gold by offering competitive Gold prices on all Gold coins.